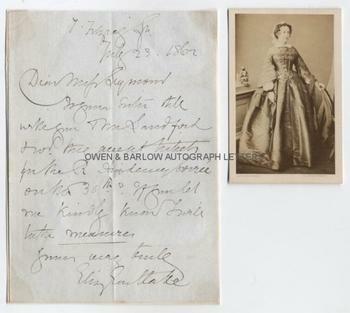 ELIZABETH EASTLAKE nee RIGBY Autograph letter Signed. British (English) art historian, critic and jounalist. Wife of Charles Lock Eastlake. ALS. 1p. 7 Fizroy Square. July 23rd 1862. To Miss [Louise Caroline Harcourt] Seymour. Together with a fine contemporary carte de visite portrait photograph. "Is your sister still with you and Mr Sandford, and would they accept tickets for the R[oyal] Academy soiree on the 30th? If you let me kindly know I will take measures." 8vo. Approx 6.25 x 4.5 inches. Laid down by corners to album leaf. Near fine. 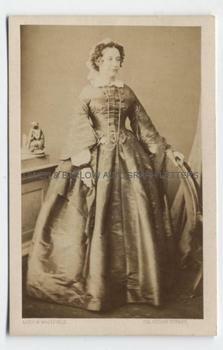 The carte de visite portrait is an albumen photograph by Lock & Whitfield, Regent Street. It is on the photographers' original pasteboard mount, with their printed details on the recto, below the image. It measures approx 3.5 x 2.5 inches (excluding mount) and is in very fine condition. The photograph is circa 1855. Lady Elizabeth Eastlake nee Elizabeth Rigby, married the artist Sir Charles Lock Eastlake in 1849. Together they formed a formidable partnership in the art establishment of Britain. Charles Lock Eastlake was a highly successful artist, the first Keeper of the National Gallery and, later, the President of the Royal Academy. Elizabeth Eastlake was one of the leading art critics of her generation and a prolific writer on art history. She did much to promote German and Italian art through her writing and was a champion of many English artists of the period, including her friend J.M.W. Turner. Elizabeth Eastlake was a pioneer of female journalism and was the first woman to write regularly for the influential Quarterly Review. However, she had a prudish side which led her to a very public disapproval of the novel Jane Eyre and to an adverse criticism of John Ruskin, which has been attributed to her friendship with his unhappy wife, Effie. Elizabeth Eastlake was, with her husband, an early supporter of the new art of photography and wrote several texts on the subject. Her photograph was taken in the 1840s by the pioneer photographer David Octavius Hill and, with her support and approval, her husband became the first President of the Photographic Society in 1853. From a 19th century album compiled by Maj-Gen Henry Creswicke Rawlinson (1810-1895) and his wife Louise Caroline Harcourt Rawlinson, nee Seynour. Sir Henry Rawlinson was a British soldier, diplomat, orientalist and traveller and has been called "the father of Assyriology".